Synopsis: When a rich woman’s ex-husband and a tabloid-type reporter turn up just before her planned remarriage, she begins to learn the truth about herself. George Cukor’s The Philadelphia Story is one of those movies that appeals to the romantic. It features a brand of sophistication that is outdated yet strangely alluring, and a glimpse into a lifestyle that is attainable only through the movies. 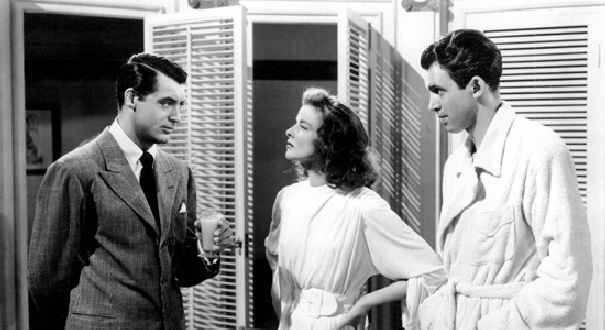 The real world has no place in the rarefied atmosphere of 40s comedies like The Philadelphia Story, a film which seduces us with riches while also gently ridiculing those who would aspire to them. Tracy Lord (Katharine Hepburn – Bringing Up Baby, The Little Minister) is an imperious, headstrong young woman. The eldest daughter of a wealthy family, she is about to be wed to George Kittredge (John Howard – Lost Horizon), a man of modest roots who has found success as a businessman but is a little in awe of his fiancé and the way of life she represents. 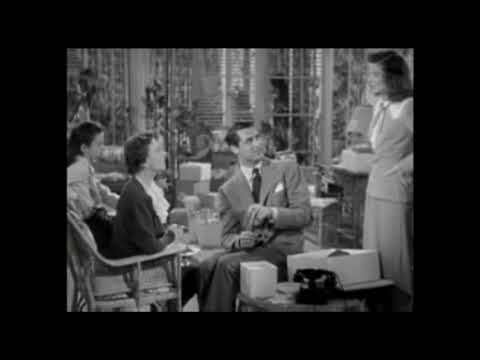 As we see in the movie’s opening scene, Tracy was once married to C. K. Dexter Haven (Cary Grant – His Girl Friday, To Catch a Thief), but their brief marriage was scuttled by Dexter’s habit of turning to the bottle to cope with Tracy’s unforgiving attitude towards his imperfections. Now, on the eve of her wedding, Dexter turns up at the Lord’s mansion with Macaulay Connor (James Stewart – Mr Smith Goes to Washington, It’s a Wonderful Life) a failed novelist now working as a reporter for a tabloid magazine, and his photographer (and unofficial girlfriend), Elizabeth Imbrie (Ruth Hussey) in tow. Dexter has been blackmailed into getting Connor and Imbrie into the wedding in order to prevent Tracy’s father’s scandalous affair with a dancer making it into his mag, but it’s clear that he still loves his ex-wife and secretly welcomes the opportunity to derail her impending marriage to the patently unsuitable Kittredge. However, his hopes look as if they might be dashed when a relationship begins to develop between Connor and Tracy. Fortunately for us – and the film – the quality of Donald Ogden Stewart’s screenplay (from Philip Barry’s original stage play) ably overcomes the vapidity of its plot. Grant, Hepburn and Stewart are engaging and attractive leads who handle the cuter elements of the plot with aplomb. The lines they speak are funny enough, but there’s also plenty going on under the surface, and some semi-serious – if rather coy – contemplation on the inter-relationship between both the sexes and classes. Each is also given enough screen time to develop a well-rounded character and back story, as are a number of the more minor characters. Support is ably provided by such Hollywood stalwarts as Mary Nash (Cobra Woman) and John Halliday (Bird of Paradise) as Tracy’s estranged parents, young Virginia Weidler as her precocious little sister, and the dependable Roland Young (King Solomon’s Mine) as her lascivious Uncle. Hepburn was something of an abrasive actress, but it’s that quality which makes her the right choice for the part of a wilful society princess who, although emotionally immature, otherwise seems remarkably unspoiled for a child of privilege. Grant gives a likeable, understated performance, leaving the showier part in the capable hands of Stewart.